Oxalis triangularis, amaryllis and Ming aralia at southeast facing window. Jan. 19, 2019. Mount Washington — In the Berkshire hills at an elevation of 1,700 feet, my thermometer readings are always lower than weather predictions intended for my location. Meteorologists seem to aim for elevations a few hundred feet down mountain. Great Barrington, at 710 feet, is a drop of a thousand feet, distinctly different meteorologically. During last week’s arctic interlude, the temperature difference between my mountain fast and valley locations was at least 5 degrees. Walking the snowy path to the woodshed when the temperature was 12 degrees below zero, with added 20-miles-per-hour winds, I quickly sensed the sting of cold on my legs through usually reliable layers of fine wool leggings underneath heavy wool trousers. My down jacket, over a turtleneck sweater and cashmere base layer, was impenetrable. The sensation of freezing legs vanished as I repeatedly reached into columns of stacked round and split 18-inch lengths of maple and oak, grasped, pulled, lifted, held, turned, twisted my torso and – savoring the rhythm – tossed the weight into a waiting wheelbarrow. 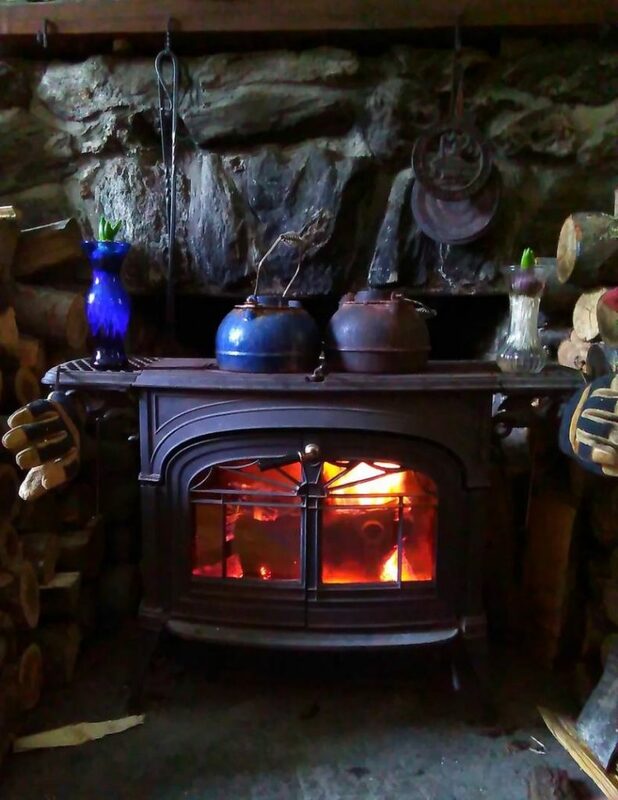 When the heap of logs crested over the edges of the barrow, I picked up the handles and ran the load to the house, unloaded it into new stacks on either side of the wood stove – and did it again! I had to stop when the frigid temperature got to my hands despite down gloves. My bare feet were still warm inside sheep fleece-lined boots. 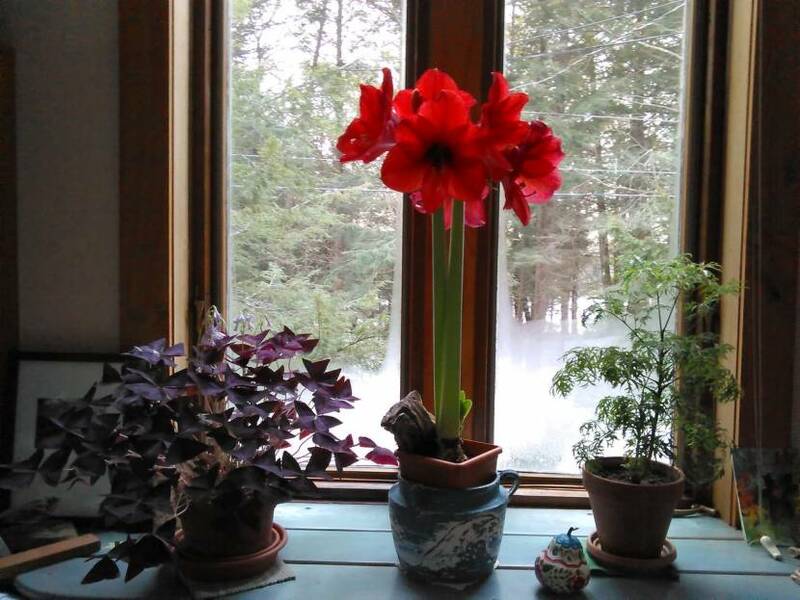 On the windowsill a potted plant has grown a geyser-like stem from which five great, velvety red blossoms have burst open: amaryllis blooms. This is the second opulent stem of the two that appear in the photograph. Surprised, as if learning of a roommate’s unexpected pregnancy, I noticed that a third flower bud has emerged at the crown of the bulb, in front of the leaves. The bud is the tip of what will grow into another standard-bearer. To raise amaryllis from year to year, care for the plants indoors until late spring, then move them outdoors until late summer. One of my favorite year-round houseplants, the Purple Shamrock, oxalis triangularis, is extremely hardy, flowers profusely and charmingly opens and closes it leaflets in response to daylight and darkness. Also charming company, the Ming aralia, nurtured from a cutting, is two years old. For the photograph, I moved the hyacinths from their perch on a windowsill to the shelves on the wood stove. The bulbs, suspended in water, grew their roots, nascent flower buds and leaves in a cold, dark, unused vestibule for nearly two months before they were ready to be moved to a bright but cool location. For forcing, hyacinths require about the same conditions as for storing onions and garlic; just above freezing temperatures. 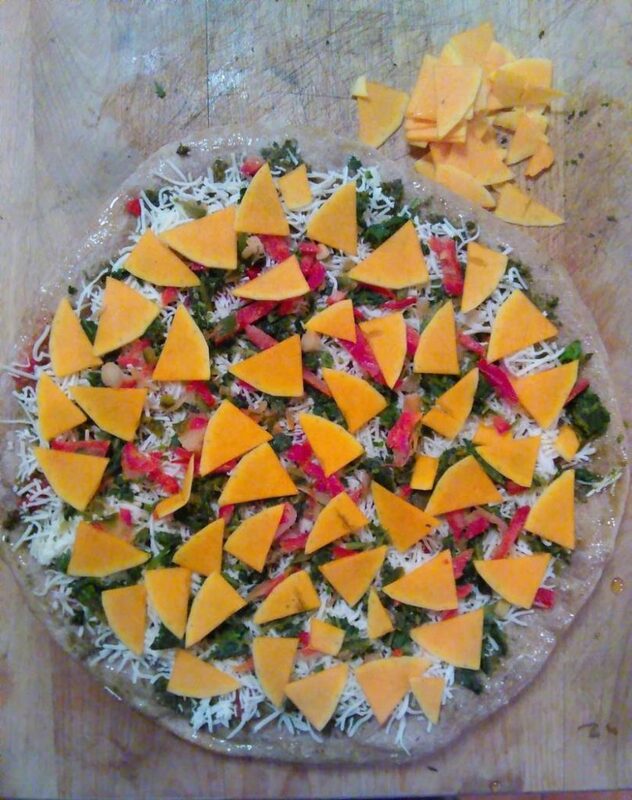 For the pizza, I foraged a stored onion and garlic from the cold vestibule and dug additional garden-grown vegetables from my freezer – sliced red peppers, basil pesto and shredded kale. The butternut squash came from a stash in a cold room, kept at close to 40 degrees. In a gardener’s cabin, all winter there is color and movement surrounding budding and blooming, coaxing wood to catch fire and assembling storage vegetables into Confetti Pizza.